After scanning in some old photos of Paris for Lady Jennie, I decided to do a few more from my favorite parts of France. Being a francophile, I like the country a lot. 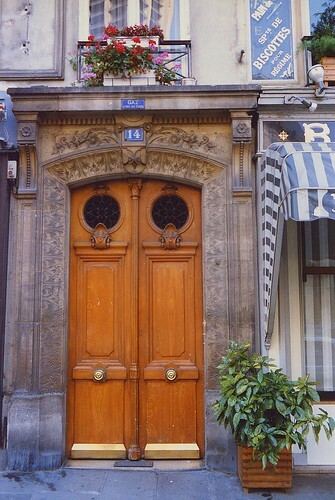 Can you stand just one more ornate door in Paris? I could photograph French doors ad infinitum. A window in the very unique village of Les Baux-de-Provence. This lovely place is up in the Alpilles Mountains and was inhabited as far back as 6000 B.C. Although it can be overrun with tourists in the summer, it’s very photogenic and definitely worth a visit. I think my favorite place of all is Aix-en-Provence. Everywhere you look, there are fountains and statues like this. The weather is perfect in the summer and the light is, well, divine. Sidewalk cafes are all over the place and the pace is leisurely. If I were wealthy, I’d buy a place in Aix. I had one of the best dining experiences of my life here. 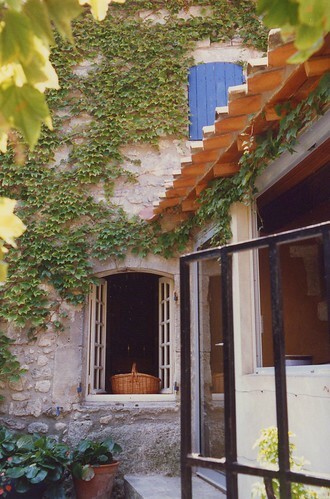 It’s at the Hotel Jules César in Arles, where Van Gogh lived and painted. 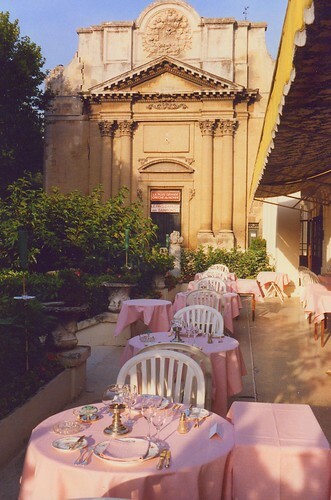 The hotel was once a Carmelite convent. I don’t even recall what I ate, only that it was delicious. What I remember most is that it was one of the most beautiful setttings I’d ever been in, and that the sky slowly turned azure blue. I’d never seen a sky of that color before, and I will never forget it. 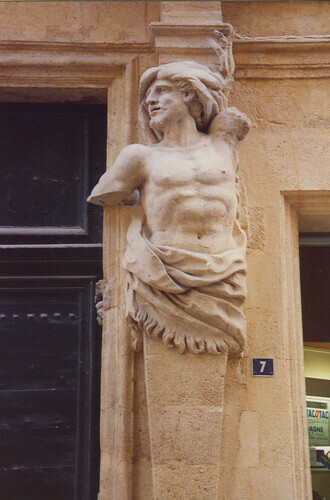 This entry was posted in photography, Travel and tagged Aix-en-Provence, Arles, bauxite, chapel, doorway, France, Hotel Jules César, Les Baux-de-Provence, ornate door, outdoor dining terrace, Paris, pink tablecloths, statue, stone, window. Bookmark the permalink. I LOVE this post, simply love it. Thanks. With tis cold and grey weather, just wonderful. Thanks, Caroline! It was only 12 degrees F. this morning, so I needed it too. Aaaa. Just lovely. I’m so glad you also posted pictures of France and not just Paris. There is so much beauty, especially in Provence. Oh yes, the country has so much to offer. If only my pictures of the Loire River valley and Bretagne weren’t so old. Will just have to go back. I am SO jealous! Gorgeous photos. Thank you so much for sharing them with us! You’re welcome. I’m sure you will go one day! Awww, thanks, Cheryl! You would love France. I’m sorry I’m behind on JPG again. Just don’t seem to have time for everything these days. Lovely photos. Brings back good memories. 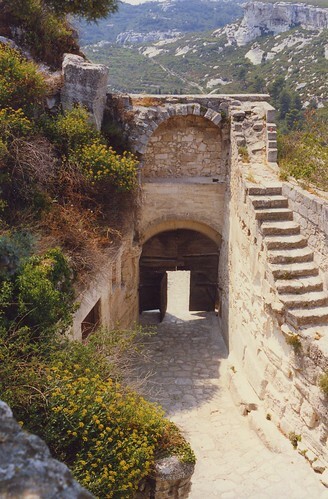 Only that the time we were at Les Baux it was in the winter and with Mistral, which is a completely different experience, but equally astonishing. I have to say. Provence is the place to be in France! Agreed! I’ve never been in France in the winter, but would love to see Paris at Christmastime.